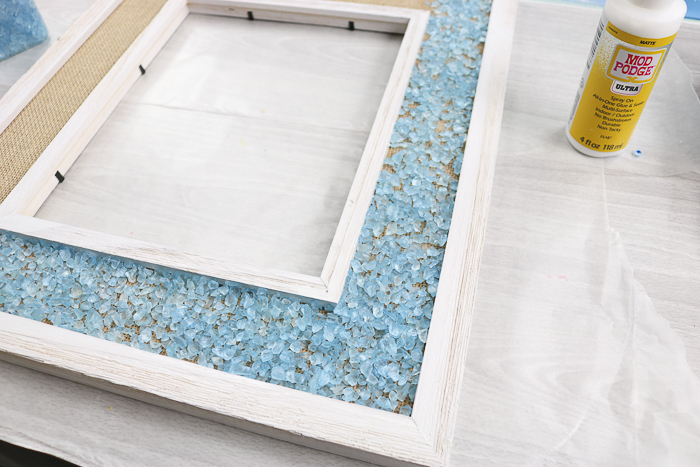 So, did you know that you can make a broken glass mosaic with Mod Podge Ultra? This week I have used this new product on glitter, fabric, paper, and twine. Now it is time to really put it to the test. Will it hold glass? 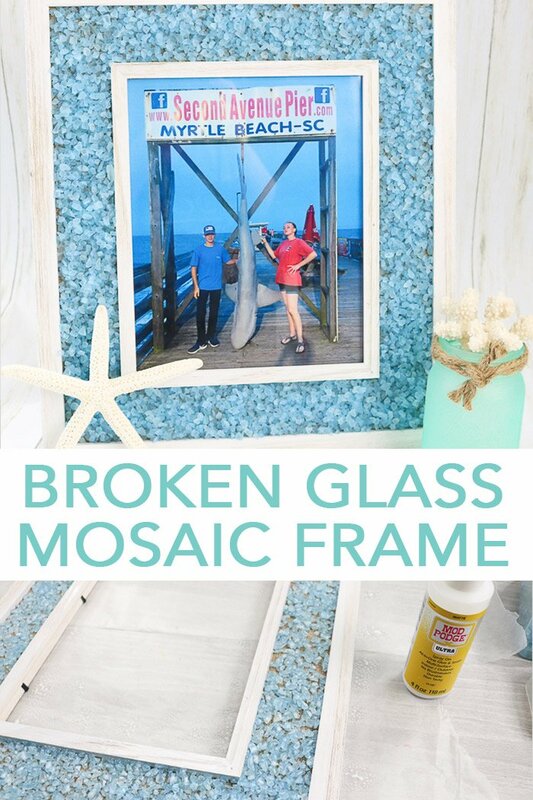 Making mosaics with broken glass is easy but what product do you use to glue on the glass? I might just have something you want to try! Remember that this is Craft Lightning Decoupage week so be sure to scroll to the bottom of this post to see today’s craft ideas as well. 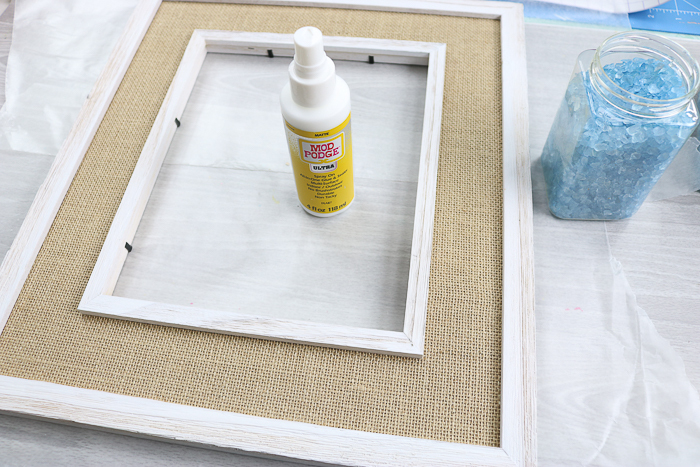 Remove the glass from inside your picture frame and lay the entire thing on a large piece of wax paper to protect your work surface. Shake the Mod Podge Ultra well and prime the pump by spraying the product on the wax paper until it sprays evenly. 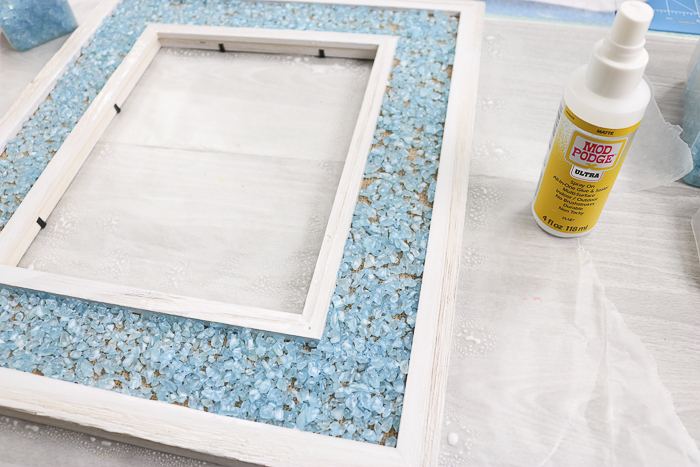 Spray the burlap inset with the Mod Podge Ultra and start laying the glass chips right on top. 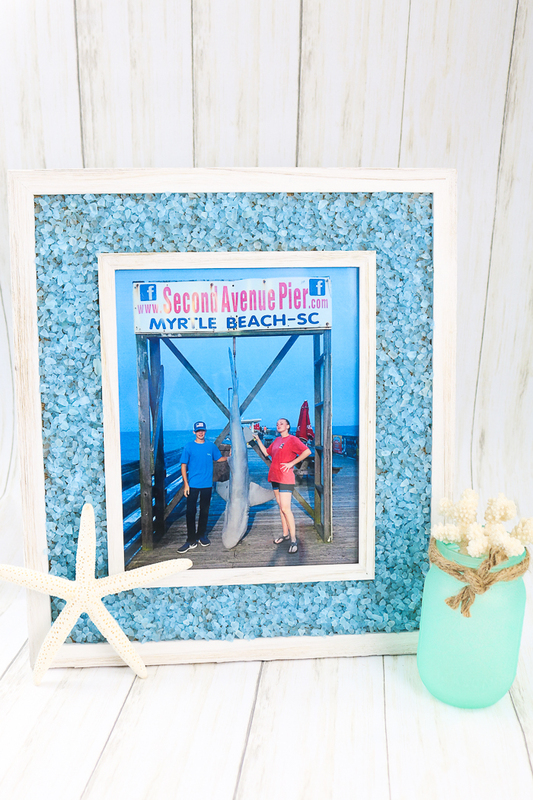 Continue all the way around the frame then spray the entire thing with another coat of Mod Podge Ultra. Allow this to dry overnight. You will need to clean the pump of your spray bottle by removing it and running water through it. After your project is dry, remove any loose glass pieces and repeat the process. Layering the glass pieces until you are happy with the look. I did three layers for my broken glass mosaic frame. Want to see how to make that sea glass mason jar? Click here to see the painted mason jars tutorial! 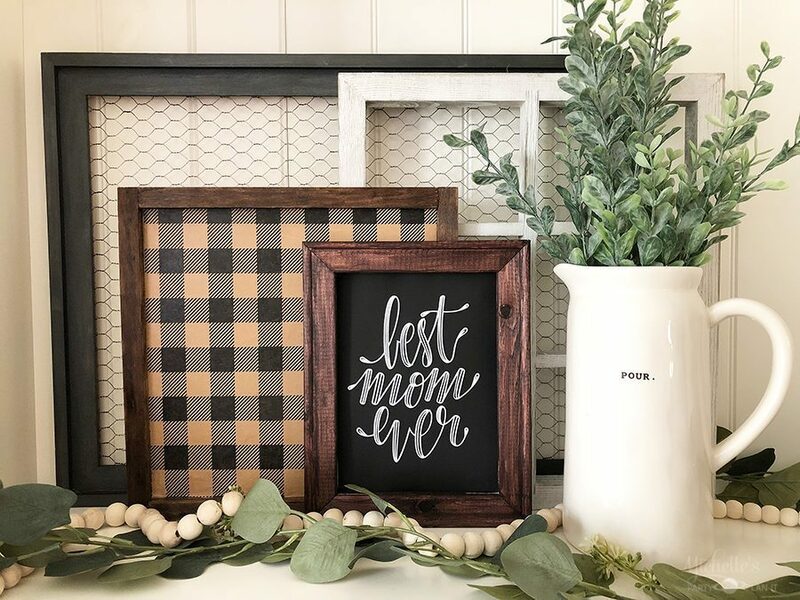 So, does Mod Podge Ultra do the job? The answer is a resounding yes! The glass is really on the frame and I am totally impressed. This stuff does a great job with your paper projects but you may want to think of it when you have something more robust as well. 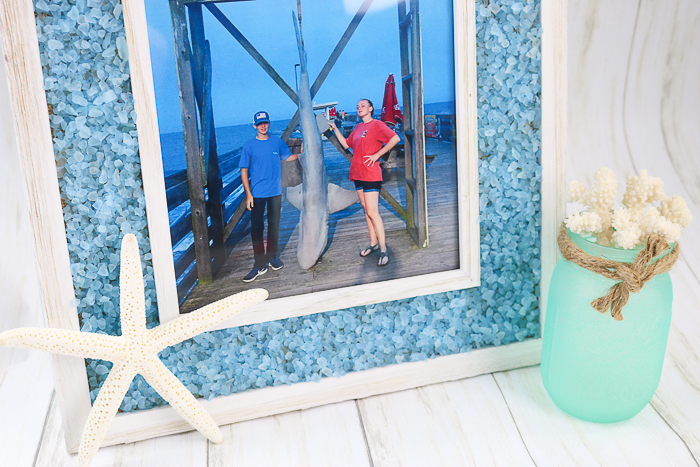 When you need to make a broken glass mosaic DIY, Mod Podge Ultra will really do the job! I mean just look at this frame and how cute it is! I love the way this broken glass mosaic turned out and can’t wait to tackle more glass projects with Mod Podge Ultra. When using broken glass for mosaics like this one, you can also use a couple of different colors. I went with all blue for a nautical look but I could also see this project with a mixture of colors. Love this glass decoupage project and want more ideas? Try the links from our bloggers below! 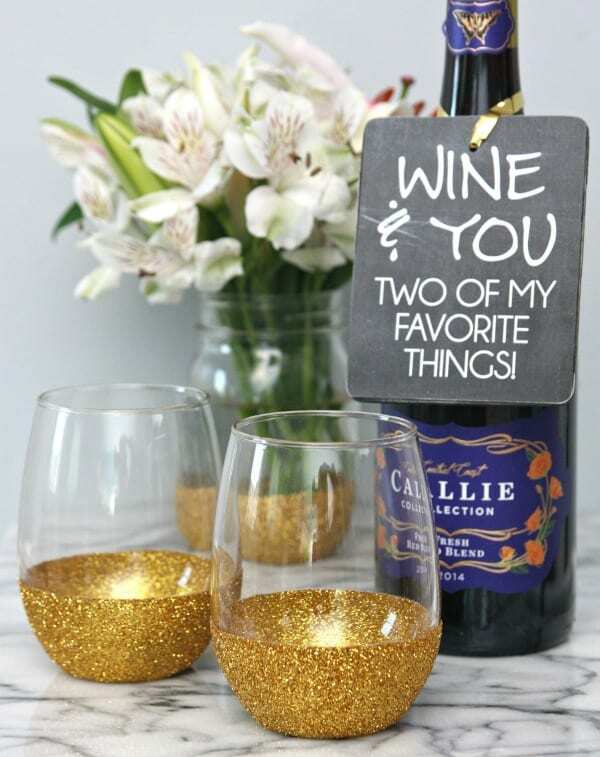 Make glitter dipped wine glasses as well as wine gift tags like these from Happy Go Lucky. Y’all know I love mason jars! 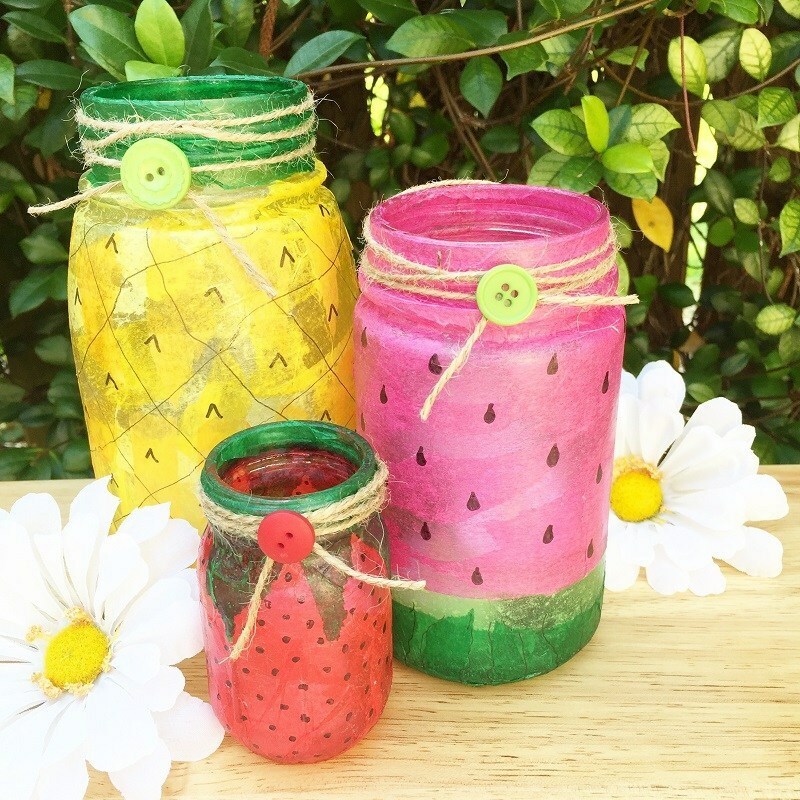 Use decoupage and tissue paper to make these summer-themed mason jars from Creatively Beth. 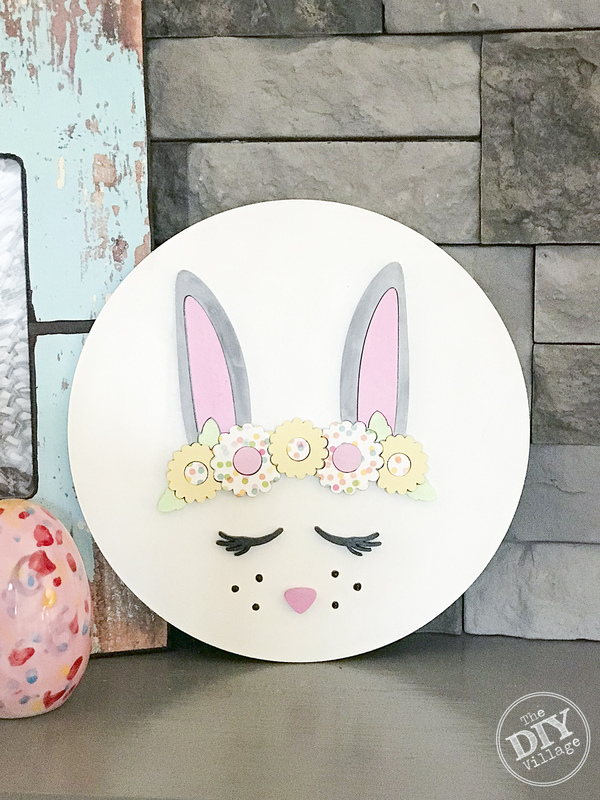 The DIY Village fired up the Glowforge to make this adorable spring bunny sign. 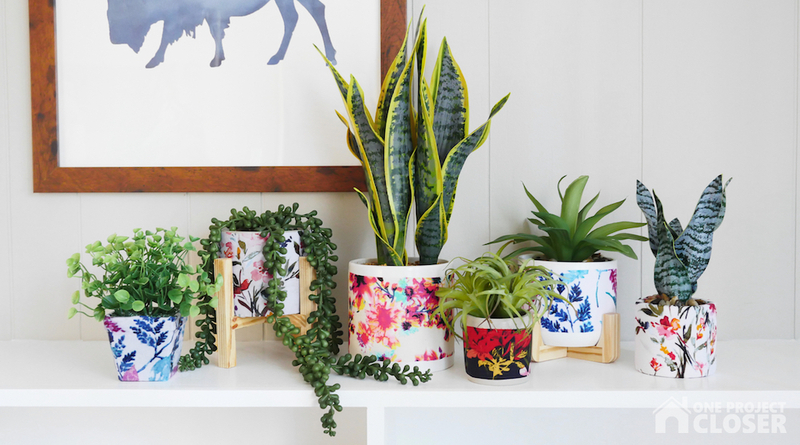 Fabric wrapped pots like these from One Project Closer are great for dressing up your plants. 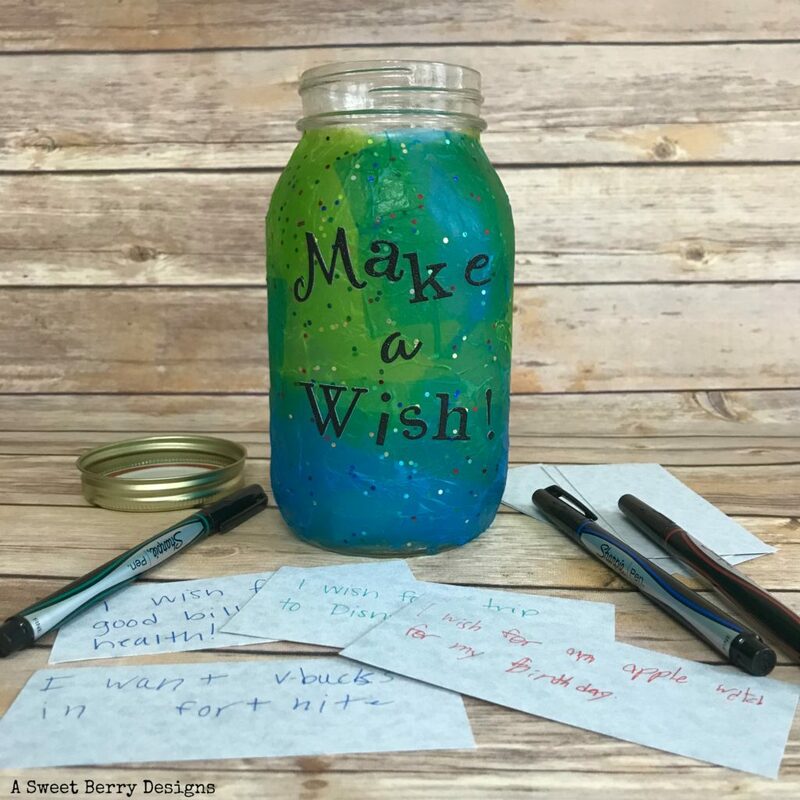 You can also try tissue paper for this Make a Wish jar from A Sweet Berry. 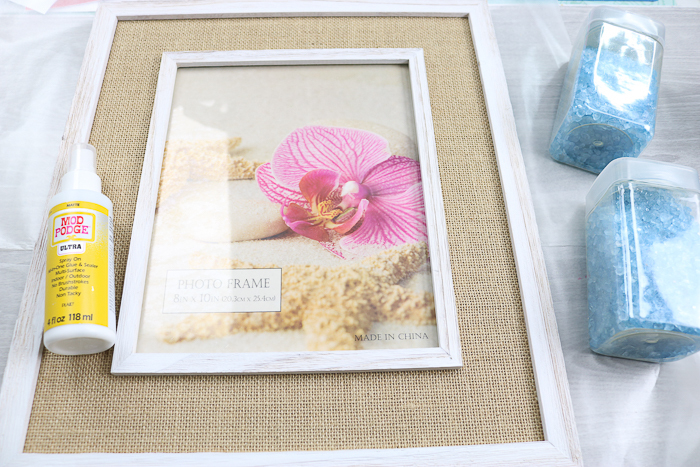 Make farmhouse art in minutes with this tutorial from Michelle’s Party Plan-It. 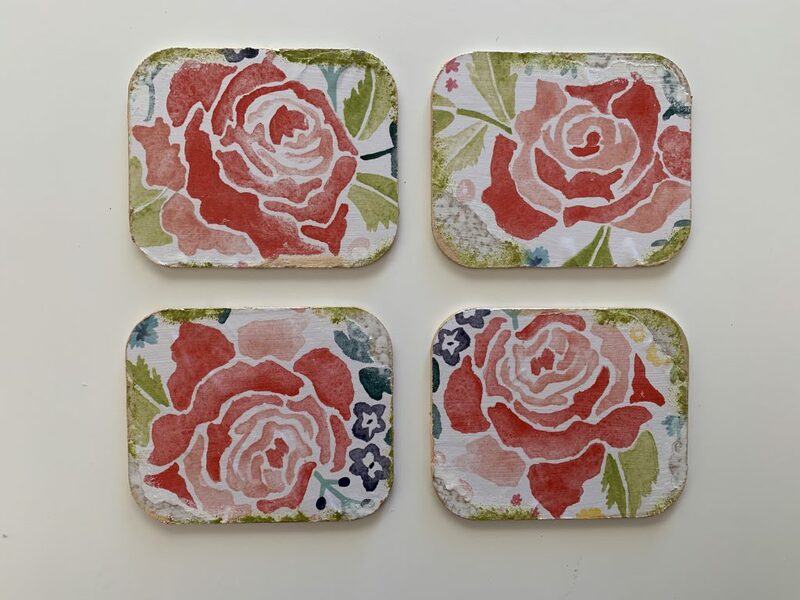 Decoupage coasters like these from Albion Gould are some of my favorite craft projects. Decoupage makes upcycling super easy! 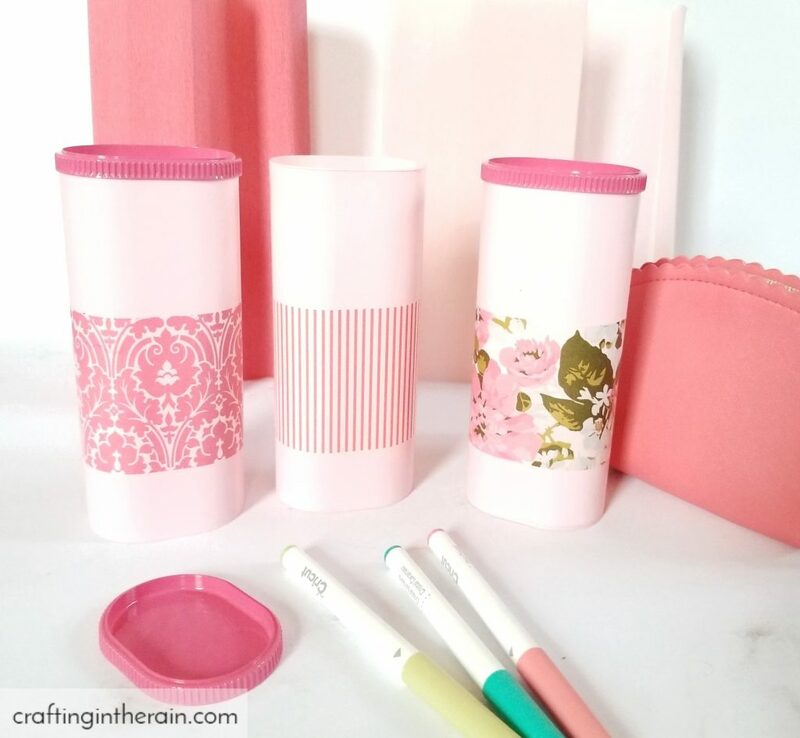 I love these upcycled Crystal Light containers from our co-hostess for this round, Crafting in the Rain. 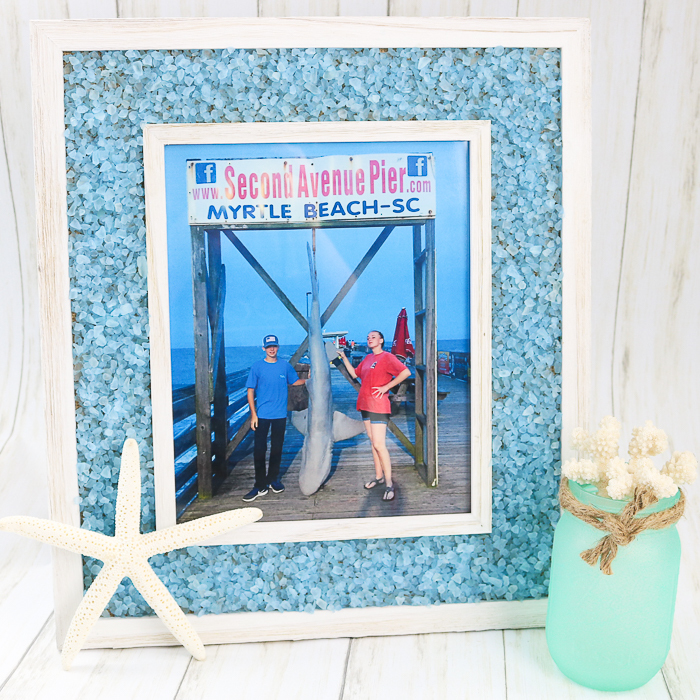 So, make your own broken glass mosaic frame or any of these other DIY projects with decoupage!